(Pevely, MO ) – Heizer Defense, known for their innovative line of powerful pocket pistols, is pleased to add their first semi-automatic pistol to the product line, the PKO-45. Heizer will introduce the PKO-45 to the public at the upcoming Concealed Carry Expo in Atlanta, GA from April 29-May 1. Heizer Defense is a Live-Fire Shooting Range sponsor for the show, which will allow consumers to test-fire the PKO-45 at the expo’s mobile shooting range. The PKO-45 or Pocket 45, is the slimmest semi-auto .45ACP on the market at just 0.8″ wide and approximately 25 ounces. The PKO-45 is made with 100% US Aerospace grade stainless steel. 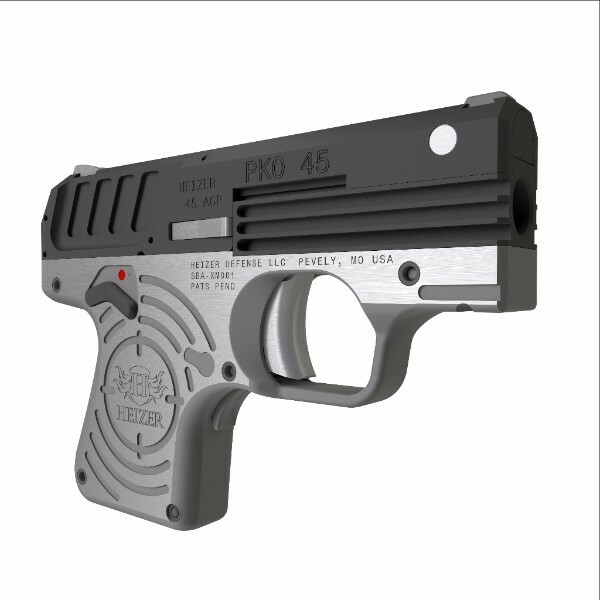 There are no plastic or mimed parts on the PKO-45. It boasts a revolutionary fixed-barrel-under-the-guide-rod configuration, resulting in less recoil felt by the operator. The PKO-45 also features a snag-free design, internal hammer/single action, and a front strap safety with an additional thumb ambi-safety. It has 5+1 capacity with a flush magazine, and 7+1 capacity with the extended magazine. This new pistol will be available for purchase in September 2016. For more information on Heizer Defense, visit www.heizerdefense.com.